In an effort to provide even more educational information about back care and spinal medicine, the doctors at the Southeastern Spine Institute in Mount Pleasant, SC, have gone to great lengths. For example, they’ve added spine animations to their website. These animations explain the conditions that can inflict your spine, as well as the corrective procedures performed at the Institute. If you’re considering a non-surgical or surgical procedure to address your back pain, view the animation to learn more about it. The Southeastern Spine Institute also has commissioned a series of insightful commercial television medical documentaries that follow patients with a variety of ailments on their paths back to health. These films, each about 30 minutes long, introduce new spinal medicine techniques, show interviews with patients and doctors, and provide informative, uplifting stories about the latest in spinal medicine. But not everyone watches TV. You may not want to sit through a 30-minute video or an animation about back pain. Sometimes, if you have back pain, just sitting at a computer can be painful. So the doctors at the Southeastern Spine Institute have developed a new strategy to ensure everyone can get the information: ebooks. Written in an informal style that makes their subject matter easier to understand, ebooks cover a variety of topics, such as spinal medicine breakthroughs and back care tips. 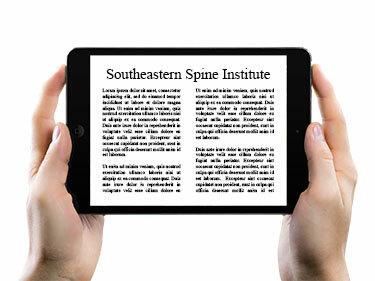 Each ebook is available for download from the Southeastern Spine Institute website as a PDF (or Portable Document Format file). You can print it out or read it on a computer or tablet with the Adobe Acrobat Reader program, available for free at get.adobe.com/reader. Each ebook has between 11 and 14 short chapters. Each chapter averages about three or four pages, meaning you can easily read one when you have a few spare minutes. The digital books range in length from 39 to 48 pages, so a whole ebook is really a quick read. And they’re packed with useful information. You don’t even have to read the whole ebook. Skim the table of contents for just the subjects you want to know more about and go to that page. While each ebook has a focus, the contents are general enough so that there’s usually something for everyone in each book.